Authorized Steel Wire Rope Suppliers | Holloway Houston, Inc.
Bridon provides solutions to the most arduous and technically demanding challenges. Bridon products are used extensively in construction, mining, oil & gas extraction, telecommunications, and other specialized areas of engineering. For markets where there can be no compromise over product performance and integrity, choose Bridon. 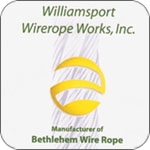 Wirerope Works, Inc. manufactures a complete line of Bethlehem Wire Rope® in a wide variety of constructions, lays, cores, and steel grades. For further technical and product information click on Bethlehem Wire Rope Product Data Sheets. In addition to custom-designed systems for specific engineering criteria, Wirerope Works, Inc. manufactures several types of torque-balanced spiral strand and wire rope for anchor and mooring systems. Please consult directly with Wirerope Works, Inc.’s engineering department for further information.